After evaluating evidence for the plausibility and authenticity of the mysterious golden plates, I must report that the Book of Mormon gets a "D" for being in an interesting bind, or shall I say binder? I cite the "D" not as a grade, but as one more subtle bit of evidence that merits attention. The "D" I refer to is the D-shape of the rings holding together the golden plates, a minor detail mentioned by only a few of the roughly twenty witnesses of the gold plates. Warren P. Aston has provided information on this topic in the article, "The Rings That Bound the Gold Plates Together" in the latest issue of Insights, a newsletter of FARMS and the Neal A. Maxwell Institute for Religious Scholarship at BYU (Insights Update No. 178, Vol. 26, 2006). It's not yet available online, so I'll share some details from the printed version. There appear to be three references to the D-shape of the rings from eye-witnesses. In 1831, William E. McLellin said that Hyrum had told him that "The plates were . . . connected with rings in the shape of the letter D, which facilitated the opening and shutting of the book." (Reported in the Huron Reflector of Norwalk, Ohio, Oct. 31, 1831.) John Whitmer in an 1878 interview stated that the plates were held together with "three rings, each one in the shape of a D with the straight line towards the center." (Interview with P. Wilhelm Poulson, Deseret News, Aug. 6, 1878.) A third possible confirmation of this comes through David Whitmer, who in 1877, while 72 years old, discussed a remarkable vision of his mother, Mary Musselman Whitmer, who said a she had also seen the plates shown to her by an apparently angelic visitor. In discussing this, he said that she observed that the plates were "fastened with rings thus" followed by a drawing of a D-shaped ring. (David Whitmer interview by Edward Stevenson, Dec. 22-23, 1877, Family and Church History Department Archives, The Church of Jesus Christ of Latter-day Saints.) Since David had seen and handled the plates, if his mother's description had been wrong, he presumably would have corrected it. These comments have not been widely noticed in the LDS community, and some have naturally assumed that "rings" were circular (although others have depicted them as being essentially rectangular with a rounded upper end, as shown in the replica displayed on a BBC page and in art by Arnold Friberg and others. However, a ring with a straight side is more efficient for holding stacked plated or sheets than a purely circular ring. In retrospect, it makes sense that experienced users of metal plates would use an efficient binder system. Warren Aston reports that the D-shaped ring "offers a full 50 percent more storage capacity than a circular ring" and "20 to 25% percent more storage capacity than a slanted semicircular shape," though details of the calculations are not given (but it sounds reasonable). The same principle [efficient ring shape for storage efficiency] governs the loose-leaf binders used today. Their history is instructive. 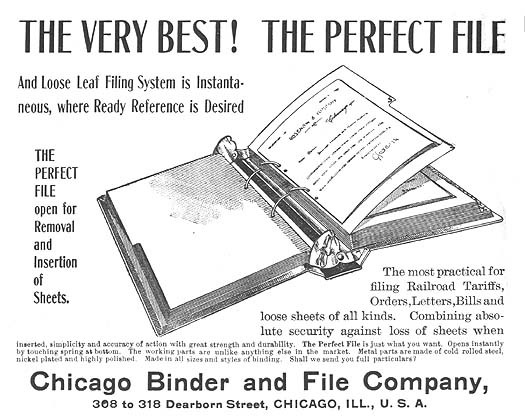 The first loose-leaf binder patent was not filed until 1854, with the first two-ring binders advertised for sale in 1899. The two improvements to the basic design followed. Within a few decades the use of three rings rather than two proved to be a more stable design and became standard. These early designs, however, used circular or oval-shaped rings. Only in the last few decades has the improved capacity of D-shaped rings been recognized and made available for loose-leaf binders. Joseph Smith displayed plates that were securely bound by three rings (not two or four) constructed in what we now know is the most efficient shape. He could not have known either of these facts in 1829 from the materials in his environment of from people who may have had greater familiarity with libraries or materials storage. Nor could he have been informed by the finds of other ancient records, as none were then known to be bound by rings. Perhaps it is not coincidence that the only other ancient record bound by rings so far known also has D-shaped rings and dates to about 600 B.C. The 600 B.C. find refers to six small gold plates found over 60 years ago in Bulgaria. See "Etruscan Gold Book from 600 B.C. Discovered" by John Tvedtnes, Insights, 23(5), 2003. As you can see from the photograph, though, that book has two rings. The D-shape of the rings is a minor and subtle detail that may have been overlooked by most people. After all, it was the gold plates themselves that were of real interest. But like so many other details in and involving the Book of Mormon, there is a whisper of authenticity in this matter. Like the very existence of ancient writing on gold plates, there was nothing in Joseph's environment or background that would have guided him or alleged co-conspirators in fabricating this detail. In fact, there is no evidence that Joseph ever mentioned the shape of the rings. This came from eye-witnesses - eye-witnesses, mind you, who remained true to their testimony of the plates throughout their lives. D-shaped rings are known to be more efficient than circular rings, but were not a common part of anyone's experience in 1830, as far as we can tell. The shape of the rings and their observation by eye-witnesses can best be explained by the hypothesis that there were actual gold plates made by actual experts in plate-based writing systems that were seen by actual witnesses. However, early marketed versions of ring binders do show two rings and perhaps that was the dominant or only commercialized form, as suggested to Warren Aston by M. Frankena. 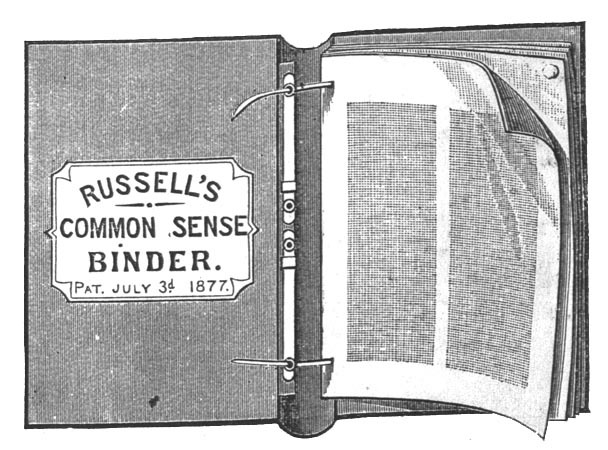 See, for example, the ad from the late 1800s for Russell's Common Sense Binder, which is based on US Patent No. 192,791, issued July 3, 1877 to W.H. Russell. While the figures show two rings, his text refers to "two or more fastening points," so three rings were also contemplated. See also US Patent No. 371,547, "Paper File," issued to C.A. Campbell, October 18, 1887. 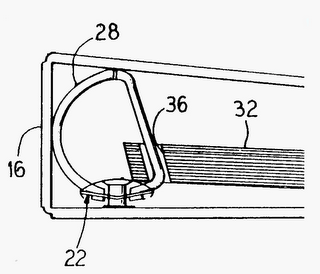 Also of interest may be US Patent No. 379,846, issued to L.A. Banks, March 20, 1888. A wide variety of early binder systems can be found by looking through US patents for the following classification codes: 402/17 and 402/25, though there are other classifications one could consider. A variation of this theme occurred the following year in US Patent No. 2,105, issued to Isaac Deterree, May 22, 1841. 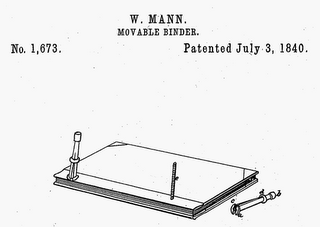 This patent mentioned "two or more" screws for binding paper, but still unlike a ring binder. 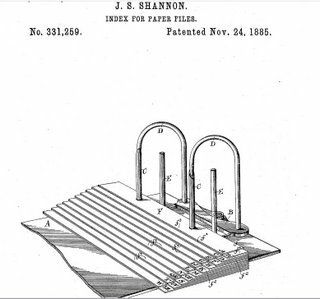 Prior to Sisson's 1859 patent, J. Shaw also patented a couple versions of portfolio binders that had rings, but they did not to pass through the sheets, but were anchors for thread that was passed through the sheets. See US Patent Nos. 15,150, issued June 17, 1856, and 6,860, issued Dec. 24, 1850. H.T. Sisson also had a slightly earlier patent on a binder system in which cords passed through sheets at three places. See US Patent No. 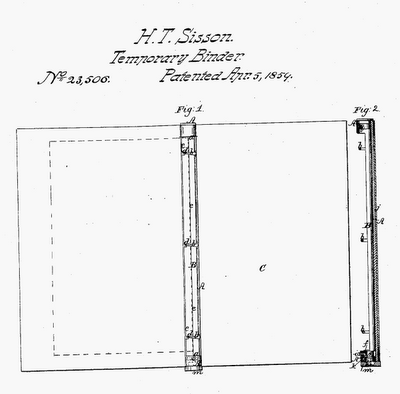 18,994, "Temporary Binder," issued Dec. 29, 1857. Circular or oval rings persist to this day, and are fine for many applications, especially when efficiency is not critical. 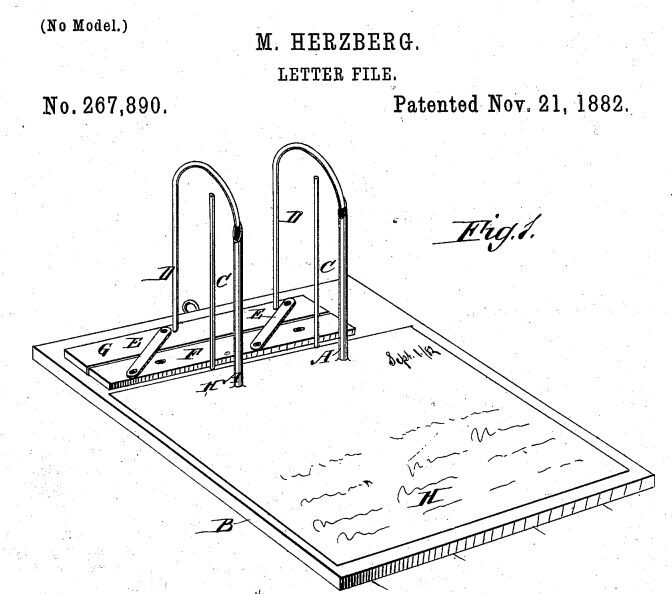 Given all this, I would say that three-ring binders were known by 1859 and that binder systems somewhat similar to D-shaped rings were known in the late nineteenth century, but again, all that was long after Joseph Smith's day. It's a minor point, and only minor evidence in favor of plausibility (the basic testimonies of the many witnesses being much more important), but it's part of the body of evidence that is difficult to account for if Joseph just made up the story of the gold plates. As a final tangential observation, the inventor of the three-ring binder, Henry T. Sisson, has been honored with a bronze statue in the Union Cemetery in Little Compton Common in the town of Little Compton, Newport County, Rhode Island. According to The Political Graveyard, Sisson was a Rhode Island Colonel in the Union Army during the Civil War; Lieutenant Governor of Rhode Island, 1875-77. 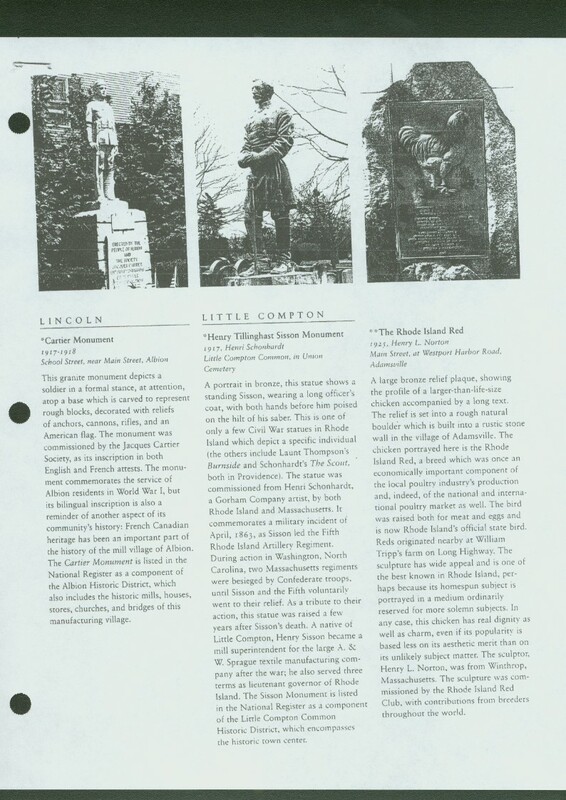 You can also view the Henry Tillinghast Sisson Monument online. It was made in 1917. You may also wish to see a scrapbook on RootsWeb.com about H.T. Sisson. Interestingly, a 2005 Christian Science Monitor quiz mistakenly places his status in Boston Commons rather than Rhode Island's Little Compton Common, and also repeats the incorrect 1854 date for his patent. A recent commenter asked about the Semitic meaning of the term "Kolob" in the Book of Abraham. Insight on the that issue comes from an article I strongly recommend by Michael D. Rhodes, "The Joseph Smith Hypocephalus: Twenty Years Later." Brother Rhodes provides an excellent discussion of Facsimile #2 and the amazingly reasonable commentary of Joseph Smith, which in my opinion could not have been fabricated based on scholarly knowledge available in the 1830s, no matter how large Joseph Smith's vast frontier library was. The god is sitting at the center of the hypocephalus, which, as was mentioned above, represents the world. Joseph Smith says that this is "Kolob, signifying the first creation, nearest to the celestial, or the residence of God." This agrees well with the Egyptian symbolism of god endowed with the primeval creative force seated at the center of the universe. The name Kolob is right at home in this context. The word most likely derives from the common Semitic root QLB, which has the basic meaning of "heart, center, middle" (Arabic [see image below] - qalb "heart, center"; Hebrew [see image below] "middle, midst", [see image below] "to draw near"; Egyptian m-qab "in the midst of"). In fact, qalb forms part of the Arabic names of several of the brightest stars in the sky, including Antares, Regulus, and Canopus. Here is an image from the PDF file of Rhodes' article showing the Hebrew terms (click to enlarge). Rhodes has much more to say about the links between Joseph's commentary and the meaning of the facsimile. He provides some of the compelling evidence that the Book of Abraham is more than just a crazy fraud. The Restoration: Why Did the Lord Wait so Long? Why did Heavenly Father go to all the trouble to set up his church and sacrifice his only begotten . . . in the process, just to let it dwindle after only 1 generation before practically [anyone] (in the grand scheme of things) had an opportunity to benefit? Then wait nearly 2000 years before restoring it? In the thousands of years of human civilization, the gospel has only been on the earth for a couple hundred years. Doesn't that strike you as odd? That fact gives me great pause. He raises an important and puzzling point that many of us have pondered. Many mainstream Christians struggle with questions about why God would choose so few to even have a chance of hearing about Christ. In the LDS perspective, the kindness and mercy of God is made available to all through the great work of preaching the Gospel to the dead, allowing all an opportunity to hear the Gospel. For those who can accept it, there is also an opportunity to receive the blessings of baptism through baptism for the dead. With this beautiful perspective, we recognize that living and dying in a land or time devoid of the full Gospel of Jesus Christ does not result in guaranteed damnation, but we rejoice to know that God is not a "respecter of persons" and that He loves all His children and will treat them fairly. First, we believe that the Gospel of Jesus Christ was available and was preached long before Christ came. It was taught to Adam, who was baptized with Eve, and they taught it to their children. It was taught by Abraham, and others, including Moses, but the fullness of the Gospel was withdrawn due to the rebellion of Israel, and they were given the lower law to prepare them eventually for the higher. It was had in the New World also, among at least some of the Jaredites as well as the later Lamanites and Nephites. And we understand that Christ has ministered to other groups anciently, whose records are not yet available to us. All this shows a pattern of the Lord reaching out to many peoples throughout history. The entire world benefits from the Atonement of Christ through resurrection. And all can benefit from the opportunity in this life or the next to hear and possibly accept the Gospel of Jesus Christ. Our ability to be tested and to turn toward God does not require that the Church itself be present, though it is a great benefit. Of course, the love of God for each soul and the meaning of their journey through mortality is not predicated upon membership in a formal religious organization. While the authority of the original Church was soon lost, not by God's will or neglect but by the actions of men, Christianity in various forms with many precious parts of the Gospel did spread across the world and brought the basic message of Christ and the forgiveness of sins to millions. We must always be grateful to those of other religions who have so valiantly worked to spread the word and to preserve the Word over the centuries. I believe that God seeks to bless His children in all nations with as much light and truth as He sees fit to give or that they are ready accept at the time. Inspiration and spiritual guidance from the Lord, though diluted with the teachings of men, may have made important contributions to the spirituality of people in many nations over the centuries, both Christian and non-Christian. The light of Christ has enlightened and blessed many, both Christian and non-Christian. We must not think that the Lord loves anybody less or that the meaning and value of their mortal experience is less just because they are not Christian or have not been baptized into the LDS Church. All will be treated fairly and have a fair chance to receive the blessings of baptism, if they so desire. Yes, the presence of the Church in our day now is certainly a great blessing, one that I wish had been available to more generations in the past. But in any case, the presence of the Church in our day is also brings with it a great responsibility. It is hear to accomplish a great work. We cannot afford to be quiet or to be inactive in advancing the cause of Jesus Christ, now that we have this treasure in our midst. Those who fight it should soften their hearts and no longer bash their heads against Mount Zion, and those who sit on the sidelines should repent and serve the Lord with all their heart and might. This is the day to labor. Many are called, but the laborers are still too few. I don't know why the Lord waited until 1830 to restore the Church, but it has been restored, and now is the time to build it up, in my opinion. One of my favorite gurus of consumer and financial wisdom is Clark Howard, a true gentleman and genuine expert whose talkshow on saving money and avoiding scams has become quite popular. As part of his dedication to helping American consumers, he has done extensive research to prepare a free guide to the college savings plans (a.k.a. "529" plans) for college savings. After surveying the plans available through each of the 50 states, he ranked Utah at the top of the list of his page about college savings plans ("529" plans). Utah is one of three states with a "superb" plan. Nice honor! People in other states that might not have a decent low-cost plan can enroll in the Utah college savings plan. I want you to know the best way to save for your son or daughter for college. But first remember my rule that you don't save a penny for college unless you are already saving the maximum you can for your own retirement. College can be paid for with grants, loans, scholarships and work. Retirement happens only if you have saved the dough. That said, after 75 hours of research I have finished my revision to one of our most popular features on clarkhoward.com, my college savings guide. While I was doing my revisions, Congress improved the college savings plan law (known as 529 plans) by making their tax-free status permanent. 529 plans allow you, a relative or a friend to put aside money for a child's college education. The plans grow tax free and, under current law, are spent tax free on the child's tuition, books and fees. If your child doesn't need the money, it can be transferred to another family member and still be spent tax free. If the child does not go to college, you pay tax on your earnings plus a 10% penalty. When you open an account, your money is invested in a pool much like a mutual fund. I recommend that you look at the investment option in a plan known as the "age based portfolio." This lets the plan adjust to a mix of investments as your child gets closer to college age. However, Congress left the most confusing and silliest aspect of 529 plans in place. Plans must be sponsored by a state even though residents of most states can put their money in any state plan. And get this, a state can sponsor more than one 529 plan. One state sponsors 7! I never found more than 1 good plan in a state. This is key. When you see your state listed below, make sure you only invest in the exact state plan that I show. Otherwise you could end up in a stinker of a plan. I have a direct link for you to the good plan in a state. If you just click on my link below you won't mess up and go to a bad state option. If your state is not listed, invest in one of the three elite 529 plans in the U.S. that are listed first: Utah, New York or Iowa. To see the state rankings and gain access to the best program links, go to http://clarkhoward.com/topics/529_guide.html. The 529 college savings plan may not be for everybody, but for many people it can a great way to save for college. Glad to see Utah with a great plan! See, there are cool things about Utah, in spite of my pro-Wisconsin bias. And this educational savings honor may even make up for Utah's shortcomings in terms of excessive marshmallow consumption and the lack of healthy polka activity. Sadly, it doesn't compensate for Utah's insane approach to traffic safety and fundraising, but that's a problem of the State Highway Patrol and need not reflect on Utah's general populace. Meanwhile, to all of you in Utah or anywhere else: save more money now. Save like there's no tomorrow, because there is a tomorrow - and your family will be broke then unless you do. I recently spoke with a man who used to oversee the distribution of marshmallows to Utah and several other states. Not long ago, he was an account manager for a major food company and knew many details about the sale of various foods in Utah. Yes, it's true that when it comes to high consumption of Jello, Utah is a national leader (Utah state motto: "Making Life a Taste of Jell' on Earth"). But did you know about Utah and marshmallows? Utah is clearly the national leader in marshmallow consumption. I think he said Utah had been pegged at about twice the national average. And from my experience growing up there, I strongly suspect that this is due to Mormon influence, not just all those marshmallow-mad Gentiles. It hope it doesn't jiggle your faith to learn that the combination of Jello and mini-marshmallows is a common feature at popular Mormon activities such as ward dinners, funerals, baptisms, marriage receptions, missionary farewells, Osmond sightings, etc. Please, I don't mean to criticize Utah or my fellow Mormons about this. There is nothing intrinsically wrong with excess consumption of gooey foam or gelatinous slime and all the associated synthetic additives, or the inclusion of such PERFECTLY LEGAL chemical concoctions in religious rituals. Wisconsin religion has it's own problems with consumption of brats and cheese and beer (not in my ward, fortunately). Out here in Wisconsin, Jello and marshmallows aren't quite as prominent in LDS congregations, but there's still plenty of sugar entering our bloodstreams at religious events (including lost of candy and cookies that get handed out to kids on Sunday - parents, take note). When it comes to promoting health, well - how do I say this without causing offense? - I think we'd all be better off adding a little cardiovascular-friendly polka to our events. As I noted in my previous post, others are a few steps ahead of the Mormons in this critical area, but I'm determined to help us catch up, while also working to cut down on unnecessary sugar intake. I've got a plan, but don't have time to elaborate now. We're having a missionary farewell reception at my house tomorrow, and it's time for me to help prepare snacks - that's right, green Jello and marshmallows, and maybe some Kool-Aid to wash it all down. Sweet! The command Be ye perfect [Matt. 5:48] is not idealistic gas. Nor is it a command to do the impossible. He is going to make us into creatures that can obey that command. He said (in the Bible) that we were "gods" and he is going to make good His words. If we let Him -- for we can prevent Him, if we choose -- He will make the feeblest and filthiest of us into a god or goddess, a dazzling, radiant, immortal creature, pulsating all through with such energy and joy and wisdom and love as we cannot now imagine, a bright stainless mirror which reflects back to God perfectly (though of course, on a smaller scale) His own boundless power and delight and goodness. The process will be long and in parts very painful; but that is what we are in for. Nothing less. He meant what he said." -- From Mere Christianity, New York: Collier Books, MacMillan Publ. Co., 1943; paperback edition, 1960; p. 160 (the last paragraph of Chapter 9, "Counting the Cost," in Book IV). We can be joint-heirs with Christ. There is divine glory to be revealed within us, for we have a divine inheritance as children of God. Just as earthly parents want their children to grow and become more like the parents, so our Father in Heaven wants us to grow and partake of his glorious gift of eternal life. It is not an instant process, but one that requires that we follow Christ and rely on His Atonement and grace, allowing Him to truly save us. 9 Furthermore we have had fathers of our flesh which corrected us, and we gave them reverence: shall we not much rather be in subjection unto the Father of spirits and live? 10 For they verily for a few days chastened us after their own pleasure; but He [God] for our profit, that we might be partakers of his holiness. Growing to become more like Christ and more like our Father in Heaven should be our goal, as Christ has commanded us (Matt. 5:48). How do we grow in that way? By following Christ with all of our heart, might, mind, and strength. Our Father in Heaven wants us to accept Christ and to follow and obey Him, that we might return to His presence and become partakers of His holiness and fullness (Heb. 12:10; Eph. 3:19), or, as Peter wrote in 2 Peter 1:3-10, "partakers of the divine nature." As impossible as it seems for us fallen mortals to become holy and become like Christ, through the magnificent grace of Jesus Christ and the power of His Atonement, sin can be rooted out and God can transform our lives, if we'll let him, to ultimately reveal the glory that is in each one of us as a son or daughter of the Living God. We are not accidental creations of chance, but children carefully created by the Father of our spirits. It's breathtaking - but also the only thing that makes sense of this mortal journey. The Wild Things of God is a beautiful and expansive Website with a focus on Christian mysticism. There are some interesting things to learn, whether you agree or not - plus I enjoy the great examples of Web design (look at the movie reviews and the spirituality section, for example). Let me know what you think. I've added it to my blogroll. I encountered this site via its page on theosis, where some interesting perspectives are offered, along with a few great quotes from C.S. Lewis and others. With Suicide on Her Mind, She Prayed . . .
One of the more stalwart members of the Church I have met surprised me with the story of his conversion recently. He told me that before he and his wife joined the Church over 30 years ago, they were party animals, living a life that brought a lot of pain. One day, his wife told him that she did not want to commit suicide, but said, "I just want this to end" - referring, I think, to the lifestyle and the situation they were in. Desperate, she tried God. She knelt down and prayed for help. Within one hour, the missionaries were there at the door. When one of them said that they were there with a message from Jesus Christ for her, she yanked them inside the house and had them teach her. A really remarkable thing is the experience that the two missionaries had in finding that home. They had felt moved to try a different area that day and were riding their bikes down the street where the woman and her husband lived. They were trying to go by the Spirit to find a place to work at that moment. They were not planning to work on that street, but as they were riding, one elder said it was as if the brakes of the bike jammed themselves in front of that home. They knew that they needed to knock on that specific door, one home out of about 50 on the street. One home out of 50 - talk about pinpoint precision. I am often touched by the kindness of the Lord in hearing the prayers of those who seek Him, though sometimes His children need to wait a little more than an hour. Thanks goodness those missionaries were also seeking His will and were there to be instruments in the Lords hands. She was hungry for the Gospel. But the missionaries were worried about the husband. After five discussions, they had not yet challenged them to baptism. The husband knew that they needed to be asked to be baptized. On the fifth discussion, he challenged the elders: "What's the holdup? When are you going to ask us to be baptized?" They explained that they had been afraid to ask him that and thought he would object. No, he was ready. Good reminder on being bold in inviting them to come unto Christ. It's been over 30 years since they joined, and they continue inspiring and helping others to this day, in spite of the many challenges life throws our way. Those experiences resonate with some of mine from my mission in Switzerland. The conversion story that touched me most deeply was that of a beautiful Swiss girl who also had contemplated suicide after feeling overwhelmed with the emptiness in her life. After finding her minister cared nothing for her needs, she prayed, and within hours the missionaries were there. Wherever you are in life, don't forget to pray. God is there and has ways to help. For many people, the help they need most (and sometimes want least) may well come in the form of a knock at the door from two young representatives of The Church of Jesus Christ of Latter-day Saints, bringing a message that I truly believe is from Jesus Christ. Distaste for Some Hymns: A Lack of Faith?? I've got a serious confession that I haven't shared with many people before. There are some hymns in the LDS hymnbook that I'm not completely comfortable with, at least not for settings of worship. Another one my least favorites list is "Praise to the Man." I'm not saying it shouldn't be in the hymnbook, and yes, Joseph was a great prophet - but do we need to sing about him so often? If it were rare, perhaps I wouldn't mention it here, but it seems to be a favorite with a lot of people. This song is from the days when the memory of Joseph as martyr yet to be vindicated as fresh on the minds of a heavily persecuted Church - is it really what we need today? For sacrament meetings, at least, it bothers me when that song comes up instead of songs about the Savior. My least favorite hymn is actually fine and has every right to be sung in a sacrament meeting. It's "God Be With You Til We Meet Again." When I was in the Hmong-speaking branch out here, it was sung at almost every meeting for two years until I nearly went crazy. OK, the Hmong hymnbook has only about 30 songs in it, and some weren't translated especially well, and perhaps it really was the best one for them to sing. But not all the time. Sacrament meetings, baptisms, priesthood, whatever - it's time to sing that song again. Help! Maybe it averaged to less than once a week, but it was enough that I could still use a little psychotherapy right now as I recall the experience. Second problem: I find it pretty boring to sing, at least for the base part. But that's my problem. I love it when hymns are thoughtfully selected for a meeting to enhance the worship experience - that's usually what happens in my little ward in Neenah, Wisconsin, fortunately. But sometimes leaders in wards might assume that any hymn will do. Not all of the hymns in the hymnbook are necessarily suitable for sacrament meeting, in my opinion, and some aren't necessarily all that suitable for many things. (None are suitable for nearly every meeting, every week.) They are there as resources, to be used carefully. I suggest that Bishops should make sure that the hymns sung in sacrament meeting especially are suitable for worship of the Savior and God the Father. Utah in the National Spotlight - Over Walking a Pony League Baseball Player?? Some talk show hosts and journalists are trying to create an uproar over a coaches decision to walk a baseball player in a Pony League championship baseball game that took place in Bountiful, Utah. In the bottom of the ninth with men on base and the game in the balance, the star hitter was up. Instead of pitching to him and taking a higher risk of losing the game, the coach ordered a deliberate walk. The next batter was young Romney Oaks, the worst hitter on the team. Seems like a smart call. But he happens to be a cancer survivor with some physical limitations. The media, aided by the boy's father (he was a guest on the "Radio Factor" talk show today), are huffing and puffing over the allegedly unfair treatment that "victimized" a boy with disabilities. Hello? Romney was there to play baseball. He was next in line after the star batter. He was waiting for a turn to bat - and he got exactly what he and his parents wanted, a chance to bat. He got it one turn earlier than normal. In fact, he was given more than just his turn at bat: he was given a turn to be a hero. Had he delivered a hit and the winning RBI, he would have all over the media and possibly the subject of a major Disney film. But he struck out. Game over. But not for the easily offended. This is being reported with headlines like, "When youth baseball goes bad . . . really bad." Very sad. The coach who ordered the walk says he didn't know Romney was a cancer survivor - something the media is glossing over in some circles. But even if he did know that, the call was a good one for the situation. If the boy is tough enough to take on baseball, he shouldn't be shielded from the realities of the game - including the reality that he will have turns at bat and chances to succeed, or fail. Can't believe I'm even writing about this. The Utah angle caught my eye - and the tendency of so many people to always find a reason to be outraged over something. You know, it kind of outrages me at times. Custody Awarded to Fathers: An Increasing Trend? On the face of it, I expected this custody battle to be an easy victory for the mother. However, I hear that Illinois has a new law that affects child custody, and allegedly makes it easier for fathers (at least in their neck of the woods). In fact, in the particular situation here, the family evaluator appointed for this case is a man who is known for advancing the theory that women alienate their children from fathers. Incredibly, in the last 70 cases the family evaluator has worked with, so I am told, every single case resulted in a recommendation for custody being awarded to the father. 70 for 70! So what's up with all you abusive moms who turn your kids away from poor ol' dad? Yes, I know there are cases where the father really is a victim or really does deserve custody, but 70 out of 70? I asked why the judge doesn't throw the guy out and challenge his track record. There's an easy answer, as there often is in the grand state of Illinois (so a lawyer from Illinois has told me). The divorce judge and the family evaluator are best friends. They go on walks together, hang out together, and appararently enjoy working together to hand kids over to downtrodden fathers. Looks like they're heading for 71 out of 71, unless the mother comes up with a lot of cash to hire a second evaluator to dispute the findings of the appointed evaluator, and engage in more costly and time-consuming legal battles. This will add months and many thousands of dollars to an already expensive and painful battle. How terrible divorce is, especially in a corrupt legal system. Any of you have any experience with the Illinois system or advice for the mother? Due to security flaws in its products, Microsoft has recently warned computer users not to open Microsoft Office attachments (PowerPoint, Word, and Excel files) even sent by trusted friends if the file is not expected. The problem is that new security holes have been found that can allow criminals to install keyloggers on your computer if you open attachments they send out from other people's infected computers to those on their email contacts lists. Thus, email that appears to come from a trusted friend may contain malware that could track all your passwords and allow criminals to wipe out your bank accounts, commit identity theft, or destroy your life in other unpleasant ways. The real problem is not Microsoft but the vicious evil of malicious hackers and other criminals, driven by greed and malice. Their crimes affect all of us, making trust a dangerous virtue, at least when it comes to email. It's not just cyberspace where trust is risky. Child abuse, theft, malicious gossip, and many other vices all make it more dangerous than ever to simply trust someone. Sad that we must be so cautious, but necessary. The company's advisory comes less than a week after virus hunters discovered that a previously undocumented flaw in Microsoft PowerPoint was being exploited to plant a keystroke logger on infected Windows systems. If an Office file--Word, Excel or PowerPoint--arrives unexpectedly from a trusted source, the advice remains the same. Margaret Barker is a non-traditional scholar of the Old Testament and ancient Judaism who has stirred a lot of interest among some Latter-day Saint scholars. She now has a Website, MargaretBarker.com. You can get a taste of why she has generated interest in LDS circles by looking at her list of publications. For example, note the overview of her 1992 book, The Great Angel, where she offers views similar to the LDS concept that Christ existed and acted as the second member of the Godhead prior to His incarnation (in fact, we believe that before the foundation of the world, He was chosen as the Son of God and promised Messiah to be slain for all our sins). In The Great Angel. A Study of Israel's Second God (London: SPCK, 1992) she tested the hypothesis that when the early Christians read the Old Testament as an account of the pre-incarnate Christ, they were reading in a traditional way and were not innovators. She proposed that pre-Christian Judaism was not monotheistic in the generally accepted sense of that word. From a comparison of ancient versions of the OT she proposed that Israel had known a High God and a second, national God, known as the Son of God Most High. Since crucial textual variants arose relatively late, as can be seen from the Qumran evidence, the second God remained a living issue during the second temple period. The hypothesis was tested in Philo, early rabbininc texts (building on the work of A Segal Two Powers in Heaven Leiden: Brill, 1978, but reaching very different conclusions), in Gnostic texts and, with unexpected success, in the Christian writings of the first three centuries. Finally she tested the hypothesis in the New Testament where the results convinced her that this was the key to understanding Christian origins. She concluded that when the Christians declared "Jesus is the Lord" they were affirming that Jesus was the final manifestation of Yahweh, the national God of Israel in the Old Testament. Thus the origins of Trinitarian belief are pre-Christian, and the heir to temple tradition is Christianity. The sensitive nature of these results made further study imperative, but nothing she has discovered since has in any way altered these conclusions. The Lord of the Old Testament as the Lord of the New Testament was fundamental to all her subsequent work. This book caught the attention of Mormon scholars [Latter-day Saints] who now take a great interest in Margaret Barker's work. I think you'll also see some strong LDS themes in her 2003 book, The Great High Priest. Interesting! A valuable LDS resource dealing with some of Barker's ideas is Kevin Christensen's work, Paradigms Regained: A Survey of Margaret Barker's Scholarship and Its Significance for Mormon Studies, FARMS Occasional Papers (Provo: FARMS, 2001). Dr. Patrick Byrne, President of Utah-based Overstock.com, is "one of the free enterprise systemÃs most compelling figures" according to BusinessJive.com. He's highly controversial, being hated and maligned by many on Wall Street, while viewed as a folk hero to many investors. What's all the controversy about? Dr. Patrick Byrne is engaged in a war against a corrupt practice called "naked short selling." This refers to the illegal practice of institutions selling stock they don't own or properly borrow, creating an apparent increase in total supply that drives the price of a stock down. It's technically called a "failure to deliver" the shares of stock that are sold. Some gurus of Wall Street like Jim Cramer and many in the media and government say they don't think this really happens or at least isn't a problem. But the SEC's own data - the few bits and pieces Byrne and others have been able to squeeze from SEC officials using freedom of information powers - clearly show another story, and reputable economics experts have shown that the data point to a serious problem of corruption. In a nutshell, this is the subject of "Byrne's War." Dr. Byrne's charges, if true, point to widespread corruption in Wall Street and in the SEC and the Depository Trust and Clearing Corporation (DTCC). This corruption that can defraud honest investors and even destroy some small companies. You can read a brief summary of naked short selling but I would encourage you to watch and listen to a presentation on the dark side of Wall Street from Dr. Byrne himself at BusinessJive.com. It takes about an hour, but I think it's worth it. After listening to his presentation (and looking at some pretty amazing case studies), I think we may have a real problem of criminal activity in Wall Street, aided by willing friends in the SEC. Also see TheSanityCheck.com for more info. Speaking out on this issue has made Dr. Byrne a frequent target of wrath. But, as Byrne said, "I'm not doing this for approval. I think America is being ripped off. I just don't know how I can walk away from that. I'm not programmed in a way that I can back out of this fight now." Wish we had more citizens with that kind of spirit. Byrne is not LDS, but he gets my "Captain Moroni Award" for valiant service against public corruption. Meanwhile, be careful on Wall Street. How unfairly the consequences of sin are distributed among its participants. Some seem to sin and move on without obvious consequences, and others face burdens and grief that can last a life time. Sexual immorality can be especially inequitable, especially when pregnancy is the result. The choices then are all so painful. Eve Burch's personal account, "A Greater Love" (June 2006 Ensign, pp. 59-60) offers the touching insight of an adopted child who later had a reunion with her birthmother. The happy reunion was an unusual event, but wonderful that it occurred. Divine kindness was evident in the events that led to this reunion. One afternoon at work, I finally convinced myself to make the phone call. I spoke with two sweet-sounding people who could not emphasize enough how happy they were that I had called. They briefly told me about their family and the circumstances surrounding my birth. Their daughter, Karen, had become pregnant as a high school senior, with no option of being happily married. They asked about me and my life. They requested my home phone number and told me they would have Karen call me that evening. So I went home after work quite anxious about the telephone call I was to receive. Karen called me as promised. We spent what seemed like an eternity on the phone together. Like her parents, she wanted to know all about me, my family, and the life I had led. She was thrilled to know that I was active in the Church, had served a full-time mission, and had been married in the temple just that year. She shared with me how difficult it had been to place me for adoption and the struggles and uncertainties she had experienced since that day, wondering if she had made the right choice. She wanted to emphasize that she did not let me go because she didn't want me or love me. She had felt strongly that I was meant to be someone else’s baby. At that point, I did what I had always promised myself I would do if I were ever given the opportunity. I thanked her from the bottom of my heart for the decision she had made and for giving me a loving, active Latter-day Saint family. I told her that, through her sacrifice, she had allowed me to have everything I valued in my life. Karen did not respond. At first, I was uncertain if I had said something wrong. Then I realized she was sobbing. It took a few minutes, but she was then able to share with me a special experience. In the years since my birth, she had often felt worried and anxious about me and would sometimes get depressed. During one of these periods she received a blessing of comfort from a family friend. He said many things in the blessing, but one promise stood out. She was told that at some future time, either in this life or in the life to come, we would meet again and I would thank her for the choice and sacrifice she had made. Our conversation that night was a direct fulfillment of that promise. Even though Karen and I were miles apart, the Spirit bore witness to both of us that her choice and my growing up in the family I did were all in accordance with Heavenly Father’s plan. How grateful I am to those who found strength to do the right thing after a serious mistake. I am even more grateful for those who continually strive to do the right thing in the first place. But in either case, or any case, no matter where we are, God can reach down and guide us miraculously and help us find joy, comfort, and purpose in spite of our past mistakes. This is what the Atonement does: it brings healing and joy, with abundant evidence of the divine that was previously unseen. "Check the Boys" shares a personal experience written Mary Rich Goodwin for the July 2006 Ensign (pp. 68-69). What happens in this story illustrates a principle so commonly experienced in the Church: a miracle of timing, of being in the right place at the right time, through responding to a simple prompting of the Spirit. In her case, the repeated prompting, "Check the boys," allowed a mother to walk into her boys' room in the middle of the night just in time to save a child's life. I think the story is worth pondering. Composition is the naturalistic explanation for the Book of Mormon--the way books are always written--but it is at odds with the Joseph Smith of the historical record. The accounts of the neighbors picture an unambitious, uneducated, treasure-seeking Joseph, who had never written anything and is not known to have read anything but the Bible and perhaps the newspaper. None of the neighbors noted signs of learning or intellectual interests beyond the religious discussions in a juvenile debating club. To account for the disjuncture between the Book of Mormon's complexity and Joseph's history as an uneducated rural visionary, the composition theory calls for a precocious genius of extraordinary powers who was voraciously consuming information without anyone knowing it. The transcription theory has Joseph Smith "seeing" the Book of Mormon text in the seerstone or the Urim and Thummim. He saw the words in the stone as he had seen lost objects or treasure and dictated them to his secretary. The eyewitnesses who described translation, Joseph Knight, Martin Harris, Oliver Cowdery, and David Whitmer, who was in the house during the last weeks of translation, understood translation as transcription. Referring to the seerstone as a Urim and Thummim, Knight said: "Now the way he translated was he put the urim and thummim into his hat and Darkned his Eyes then he would take a sentance and it would apper in Brite Roman Letters. Then he would tell the writer and he would write it. Then that would go away the next sentance would Come and so on." Joseph himself said almost nothing about his method but implied transcription when he said that "the Lord had prepared spectacles for to read the Book." Close scrutiny of the original manuscript (by a believing scholar) seems to support transcription. Judging from the way Cowdery wrote down the words, Joseph saw twenty to thirty words at a time, dictated them, and then waited for the next twenty to appear. Difficult names (Zenoch, Amalickiah) were spelled out. By any measure, transcription was a miraculous process, calling for a huge leap of faith to believe, yet, paradoxically, it is more in harmony with the young Joseph of the historical record than is composition. While much remains unclear about how Joseph did the translation (was it really so literal or direct as some witnesses assumed? ), all witnesses insist that it was a divine process of translation, not a work of composition. And that's consistent with the manuscripts that have survived, as Royal Skousen has masterfully demonstrated. Naturalistic explanations for the Book of Mormon are unable to explain how he could have written it, let alone why. And a severe obstacle for the composition/plagiarism theories is how Joseph could possibly have hoped to have gotten away with a fraud that involved so many witnesses - and why they all would go to their graves insisting that the plates were real and the translation was divine, even when some of them had fallen out with Joseph Smith. Truly the Book of Mormon is a marvelous work and a wonder. Always several years behind the times, I finally watched the 2003 Mormon movie, "The Best Two Years." I was surprised to find it and another Mormon movie at our local video rental place. I think it's my favorite Mormon movie so far, and would even recommend it to young people preparing for a mission since I felt it was a relatively realistic representation of some aspects of missionary life, in spite of having a bit too much corny acting. The importance of unity in a companionship was one theme I considered while watching the movie. How vital that is, and how challenging it is when a companion can be so different. But this is possible, though the miracle of charity is often needed. A recent new convert in our ward shared his testimony and conversion story recently. He observed that once he joined the Church, he got lots of strange questions from his friends in high school (mostly seniors, I think). One of the questions was, "Don't you guys believe in something about golden marbles in a bag?" Yes, that's it - Joseph Smith and the famous golden marbles in a bag. Ignorance can be costly. Much more harmful than confusing gold plates with golden marbles is the issue of our basic religious orientation. The reason I object to the constant denials of our Christianity is not because I'm so anxious to be accepted in the same club as Protestants or Catholics, but because I desire to follow Jesus Christ, and desire to have other sincere seekers of Christ know where to find His restored Gospel. To me it does matter when other ministers tell their congregations that we are not Christian. Not because I'm bothered by name calling, but because people will be deceived and scared away from the very thing they may be seeking - Jesus Christ and His restored Gospel. The tactic of calling us non-Christian and especially a "cult" is deliberated intended to close people's mind and frighten them when they meet Mormons. And that does more than offend me with name-calling: it blinds good people to the truth and can ultimately deprive them of the happiness and great blessings that the Gospel brings. We are Christians, we do strive to follow Jesus Christ, the same Jesus Christ in the Bible, and imperfect as we are, we are happy to share the good news that the fullness of the Gospel of Jesus Christ has been restored in our days. Come and see! Still Not Christian . . .
My name is ****, and I just recently came across your website, www.jefflindsay.com , and I must say I took issue with a lot of the things you had to say. But most prominently, your claim that Mormons are Christians. This is an untrue claim because the LDS church rejects some of the most fundamental Christian doctrines. Being a Christian is not simply whether you claim Christ as your Lord and Savior, because Jesus said "Not everyone who says Lord, Lord, will enter the kingdom of God" (Matthew 7:21). He says only those who do the will of His Father. Christianity is not about what you say, but what you do. That's why James says "faith without works is dead" (James 2:20; 2:26). We are saved not by works, but only by faith in Christ (Ephesians 2:8, 9). If your denomination rejects this principle, it is not legitimately Christian. If we interpret Scripture by Scripture, we will realize that works cannot save us. When James says "faith without works is dead," he was saying that works are the evidence of our faith. We are saved *unto* good works, not *by* good works. Also, the LDS church rejects the doctrine of the Trinity. The doctrine of the Trinity is a key doctrine for any legitimate Christian denomination. The Trinity, though not explicitly taught in Scripture, is implicitly taught. For instance, we get our first clear indication of the Trinity in Matthew 3:16-17. Jesus said, "Anyone who has seen Me has seen the Father," (John 14:9). This statement would not make sense if Jesus and God were merely one in mind and intention. He says "If you have seen Me, you have seen the Father." They are one and the same. Jesus also said, "I and the Father are one," (John 10:30). He doesn't say "I and the Father are one in mind and intention," but He said "I and the Father are one." Period. Additionally, all the Jewish leaders knew that Jesus was claiming to be God. That's why they wanted Him put to death. There was no doubt in their minds that this Jesus was "blaspheming" by claiming to be God. I understand that you don't know me, and I'm pretty much coming from out of left field here, but I really felt compelled to e-mail you about this website I came across. There are definitely more essential doctrines rejected by the LDS church, but I didn't want to bombard you right now. I would love for you to reply back to me and tell me what you think, and perhaps open a dialogue where we could discuss these matters. I absolutely believe that it is only through the grace of Christ that we are saved, and that we cannot possibly earn our way to heaven. But to accept the grace He offers, we seek to follow Him. Why did He say that we must "If thou wilt enter into life, keep the commandments" when asked what one does to have eternal life in Matthew 19? But how is it that a disagreement over how one interprets scripture can be used to deny someone's status as Christians? What is your definition of Christian? Someone who believes only exactly the way you do? What does the Bible give as the definition of "Christian"? We fully agree with the Christ's statement that to see Him is to see the Father. But there are several ways it can be interpreted. What is your basis for requiring that the only way one can be Christian is to accept a formal creed crafter 400 years after Christ by bickering philosophers, when that creed is not found in the Bible but is based on human interpretations of scripture combined with Greek philosophy? What of Christians who accept what Christ said when He said he was going to ascend to His father in John 20:17, or accept what Stephen saw when in Acts 7 he saw Christ at the right hand of the Father? Is it not possible that two Beings are one in some way other than the metaphysical union of the creeds? Is accepting those verses literally cause for exclusion from your particular definition of Christian? And what about Christ explaining that Christians should be one in the same way He and His Father are one (John 17)? Doesn't that suggest a oneness other than metaphysical oneness of substance devoid of a tangible body? Why should accepting a reasonable interpretation of the oneness God other than the metaphysical postulates of 5th-century creeds result in condemnation as a non-Christian? Is there a Biblical basis for any of this? So what is the true definition of Christian - one that would not exclude the earliest Christians of all who don't seem to have hear of modern Protestant views? FYI, I have a page dealing in more detail on the oneness and unity of God.